The Fantasy Football Scout Hall of Fame creates titans. It is the ranking system that allows James Egersdorff to justifiably refer to himself as the world’s number one fantasy football manager, and has turned an unknown, enigmatic Finn into – let’s be honest – a living legend. In this article I aim to explore not only how the HoF works, but – by contrasting it with a few alternative HoF tables – why it remains so celebrated amongst FPL cognoscenti. Like all great inventions the HoF was born out of necessity – in this case the desire to win a mini-league! Created by Chris Atkinson (aka RMT’s Professor) in 2011, the HoF was initially a tool for him to improve his FPL management skills. Chris wanted to learn from the cream of the crop, and devised the HoF as means of identifying them. Originally the HoF had a dual purpose. Not only did Chris want to identify the best managers, he also wanted to know which players they had in their squads. Something similar exists today on reddit, it looks at player ownership among veteran managers compared to the crowd. However a HoF version would add value due to the recency weighting it uses when rating managers (more details later in the article). I think this would be a great new feature for FFS to consider. It’s understandable that these ‘points divided by max score’ numbers are not shown in the HoF, as they are fairly meaningless to the average manager. It is much easier to relate to a rank, which serves as a simplistic barometer of a manager’s capability. 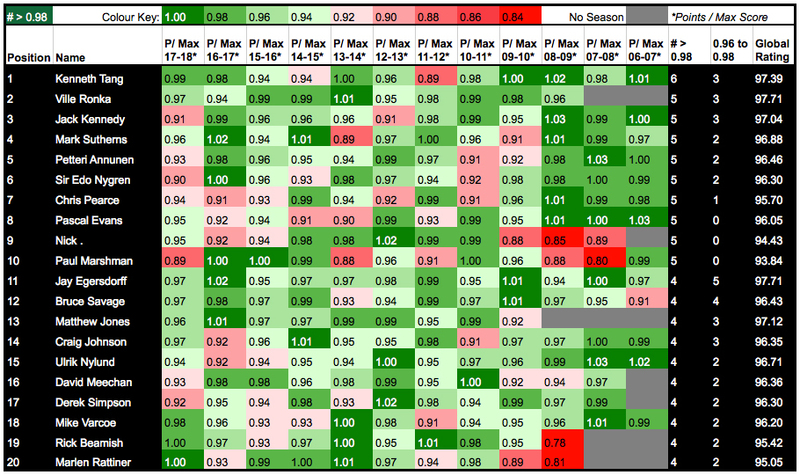 However ranks are not as effective for comparing different seasons. One simple reason for this is the ever increasing number of people playing FPL, which makes it harder to achieve a high rank. 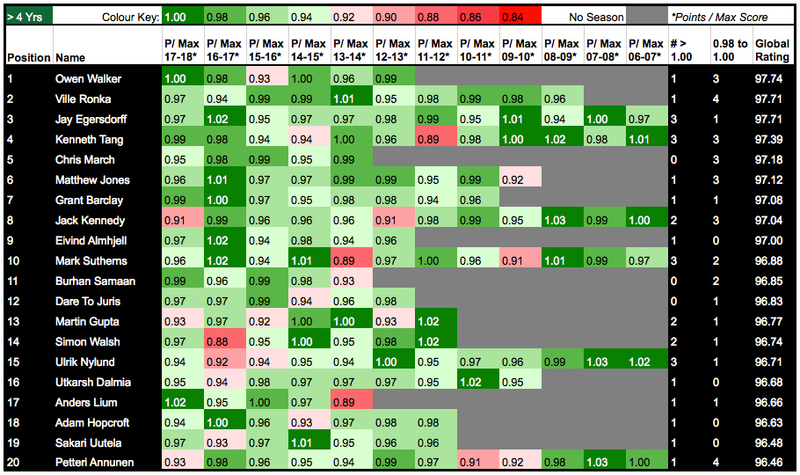 To make the table a little easier to read I’ve added some basic conditional formatting to the numbers – green highlights a good season, red a not so good season. The game is constantly evolving with tweaks to the scoring and the addition of new chips, plus access to an ever increasing number of stats to help managers make decisions. Not only this, but football tactics have developed too with wing-backs, false 9s, and player rotation more common today than they were ten years ago. What’s impressive is the number of managers in the HoF who have remained consistent despite the changes. James Egersdorff, Mark Sutherns (aka Mark), Ville Rönkä, and Kenneth Tang (aka Kenneth Tang) stand out as managers who were as excellent in the early years of FPL as they are today. A quick note on the colour formatting and number rounding: Rick Beamish, for example, his score of 1.00 last season is in fact 0.997758882 (rank 527) whereas his score of 1.00 in 2013/14 is 1.002676184 (rank 241) this explains the different colour formatting despite the same rounded number. The next table removes the recency weighting. Instead of the ‘HoF Rating’ the table is sorted by a ‘Global Rating’, which is an average score of all the seasons a manager has played FPL. Managers must have more than four years data to feature. The most consistent manager according to this table is Owen Walker, who moves up from fifth place in the HoF. Other notable movers are the Finnish Legend himself, Ville Rönkä, and Kenneth Tang. It will probably turn out to be Jonty, sorry, Joe. One reason Jay slips to third in this table is that compared to his HoF rating of 98.02, his Global rating of 97.71 is not boosted by his exceptional score of 1.02 (rank 105) in 2016/17. The recency weighting applied in the HoF has no impact on his Global rating. There are noticeably more grey boxes in this table compared to the HoF. Unlike the HoF rating, seasons when managers weren’t playing FPL are ignored completely and therefore don’t affect the Global rating. The HoF, on the other hand, fills in the blanks – it creates a rating for the missing seasons. This has a negative impact on Owen’s HoF rating. 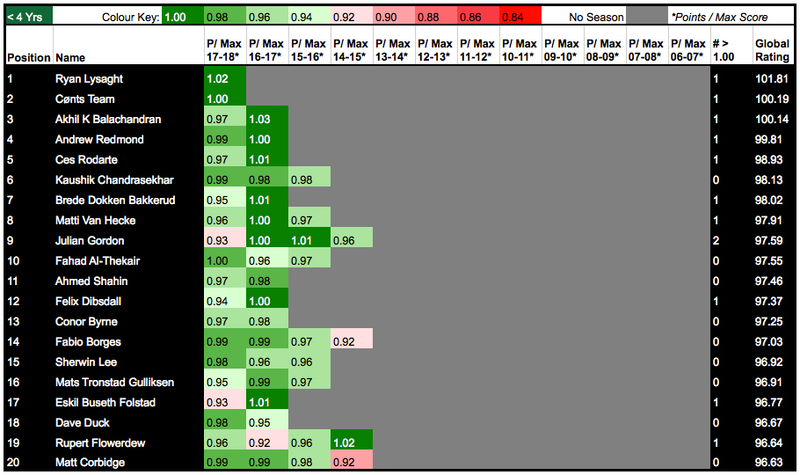 Comparing Owen’s missing seasons with Jay’s early years we can perhaps understand why Owen is not ranked above Jay in the HoF. 1) Jay has been playing FPL to a very high standard for twice as long as Owen, surely that should be reflected in the HoF? 2) Owen has six seasons under his belt, all excellent, why should he be marked down simply because he hasn’t played as long as Jay? 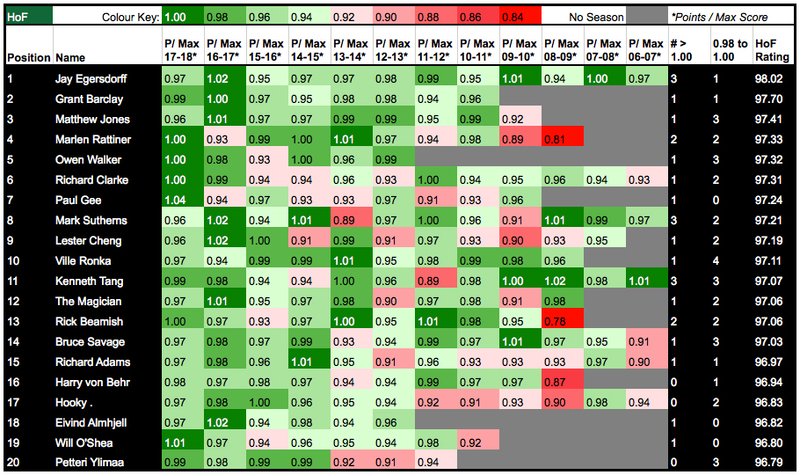 It should be noted that the impact of Owen’s missing seasons is lessened due to the recency weighting used in the HoF. Each season is weighted at roughly 80% of the previous one. So going back 6 seasons, the effect of those missing years has been greatly reduced. If the previous table focused on the Arsenal’s of the FPL world – consistently securing Champions League or Europa League qualification without actually coming close to winning the Premier League – the next table looks at the Chelsea’s – winners one year, 10th the next. It follows the logic proposed by Nick (aka Triggerlips) amongst others, that bad seasons should be ignored because to be the best you need to take risks. This table, therefore, ranks managers according to the number of exceptional seasons they’ve had. I’ve defined exceptional as the number of times a manager has achieved a ‘points divided by maximum score’ greater than 1.00. After this the table is sorted by scores between 0.98 and 1.00, and finally by the Global rating. According to this table Kenneth Tang is the most successful FPL manager with three scores above 1.00 and a further three scores above 0.98. His three monster scores all came in his first four seasons of playing FPL – 1.01 (rank 158), 1.02 (rank 150), 1.00 (rank 132) – followed by three incredibly high scores in his five most recent seasons – 1.00 (rank 384), 0.98 (rank 2,881), 0.99 (rank 1,187). Fantasy Football Scout’s Mark Sutherns ranks second in this table, although his monster seasons are more spread out when compared to Kenneth’s – 1.01 (rank 268) in 2008/09, 1.01 (rank 42) in 2014/15 and 1.02 (rank 115) in 2016/17. Another recognisable name on the list is FFS contributor and former Career HoF number one, Peter Kouwenberg (aka My Pretty Pony). Peter’s recent history is exceptional with two scores over 1.00 (ranks 138 and 129) and a further score over 0.98 (rank 289). Although last year was by far his worst season – score 0.90 (rank 253,757) – it is not altogether surprising that a manager like Peter, or indeed another former Career HoF number one Ulrik Nylund, should have up and down FPL careers given their tendency to make a lot of transfers. Ulrik has been known to take 16 point hits and has already played his Wildcard this season. For these two managers taking hits has proven to be a successful strategy but, as I speculated in my previous article, given that last season was notable for its low ‘Immediate Transfer Points’ it perhaps wasn’t destined to suit their style. You’ll notice there are more red boxes dotted around compared to the previous two tables in this article. This reflects a greater range of scores because bad seasons matter less. H J Saarinen ranks 12th with two seasons over 1.00 and a further two over 0.98. This is despite a score of 0.52 (rank 2,537,859) in 2011/12. H J Saarinen followed this poor season with an exceptional one, coming 152nd in 2012/13. This is the pattern you might expect of someone who actually wins FPL, and it describes current champion Yusuf Sheikh to a tee. The season before be claimed the FPL crown Yusuf managed a distinctly unimpressive rank of 1,030,675 and he had never previously been higher than 362,971. Is he just a ‘one-hit wonder’? While it would be unkind to refer to former champions Tom Fenley (2013/14), Simon March (2014/15), and John Frisina (2007/08) as ‘one-hit wonders’, all three only have that one truly exceptional season in their history. Despite gaining top 10,000 ranks, none have crossed the 0.98 threshold in any of their other seasons. The ultimate definition of a one-hit wonder is Dimitri Nicolaou, who won at his first attempt in 2015/16. To prove the point he followed that up with a rank of 1,031,214. However not all past winners fall into this category. Australian Sir Moult, winner in 2008/09, came 516th (score 0.99) in 2013/14. Chris McGurn, winner in 2010/11, had two more excellent seasons beating the 0.98 mark in 2012/13 (rank 858) and 2008/09 (rank 1,517). Likewise Ben Crabtree, winner in 2016/17, enjoyed excellent seasons in 2011/12 (rank 353) and 2010/11 (rank 1,369). However it’s Matthew Martyniak, winner in 2012/13, who is the most successful former champion. Ranked 11th in this table, Matthew has achieved one exceptional (1.01) and two excellent seasons (0.98 and 0.99) in addition to his victory. His first exceptional season came back in 2007/08 (rank 707) and his two excellent seasons immediately followed his victory – rank 995 in 2013/14, and rank 731 in 2014/15. In his book “Wasting Your Wildcard”, David Wardale includes quotes, anecdotes and stories about several past winners. Matthew’s story is a somewhat cautionary tale; if anything winning FPL had a detrimental impact on his life. It’s an insightful read. Matthew’s story is a reminder that we shouldn’t lose sight of why we started playing FPL. The next table tries to strike a balance between excellence and consistency. The thresholds have dropped – the table is sorted by scores over 0.98, followed by scores between 0.96 and 0.98, and finally the Global rating. Suddenly Ville’s name – absent from the previous table – reappears. His consistency is excellent without being truly exceptional. Perhaps this is a consequence of his risk averse approach? Holding onto the number one spot for the second table running is Kenneth Tang – possibly the only FPL manager who can claim to be consistently exceptional. That he is ranked down in 11th in the current HoF is due to its recency weighting, as he hasn’t had a truly exceptional season for a few years. Also deserving of a mention is Matthew Jones (aka Numb) as the manager with the fewest number of seasons (9) to make the top 20. Only two of Matthew’s seasons have been below the 0.96 threshold, and one of those was his very first season in FPL. The FPL equivalent of the Young Player of the Year award, the next table looks at the best new managers to be playing the game. Sorted by their Global rating, managers don’t actually have to be young to qualify but they must have no more than 4 years experience. Ryan Lysaght’s first season saw him finish fifth in the Fantasy Football Scout Members League. Hugely impressive for his maiden season although not quite matching the debut feats of Dimitri Nicolaou. No doubt he’ll be hoping he doesn’t suffer the same fate as Dimitri in his second season. Looking at this table, it’s perhaps easier to understand why the HoF accounts for missing seasons by generally marking them down. As good a start to their FPL careers as these top new managers have made, I don’t think anyone would consider them better than Jay at this early stage. Nonetheless, future Hall of Fame stars could emerge from this list – who will take over from current top 20 HoF managers Owen Walker and Eivind Almhjell (6 seasons each) as the new kids on the block? One stand out name in addition to Ryan’s is Julian Gordon. Julian has two exceptional finishes (scores above 1.00) in his four seasons playing the game. He’s certainly one to watch out for. DID CHRIS WIN HIS MINI-LEAGUE? After going to all the trouble and effort of creating the HoF, you would certainly hope so. With apologies to Charlie Adam and Joleon Lescott, but the “sickly coating of luck” they served up no doubt had Chris vomiting all over his laptop. Chris, if it’s any consolation, you deserved better. I think getting the balance right between long term and short term history is really interesting. The managers I try to emulate, or learned from most when I started, was the really consistent managers; though maybe not as spectacular as others they didn't have as many dips in form and consistently put themselves in a position to win and get a good rank. Horrific thought. Does this comply with GDPR? btw Great tables, thanks for all the hard work. Firetog, I have a confession to make - the New Managers list was too populated by people with only one season history. so I left only the top two in. In terms of managers with one season you came 4th. You have a Global Rating of 98.69 and would have been 7th in the New Managers table. I removed people for a few reasons, 1) Dimitri Nicolaou, who won and then got a rank over 1m - the chances of getting a very high rank two years in a row is very low, so the new managers are bound to drop down next year. 2) half of the managers with only one season history aren't playing this year! Or at least they haven't signed up to FFS if they are. So their info is not relevant. Julian Gordon is the stand out newcomer for me with two seasons over 1.00, Let's see how he gets on this year. Thanks for the clarification, hopefully I’ll have be able to maintain that grade and make and appearance next year. OK I've decided I'm going to create a New Managers table including those who had a good first season but only those managers who are also active this season. That should mean it isn't too first season heavy, while still acknowledging those who have done well like yourself. I won't get time to do it until Sunday but I will post a link here. Originally I was working off end of season data (I started this article a while ago), now we know which managers have dropped out from the first season group, it helps. After reading the above article, what are your thoughts on the ranking systems? Which do you prefer? Do any of the names in these tables, or out of them, surprise you? The main takeaway for me is that although some of the top managers are always included, there is a larger pool at the top than we sometimes imagine. Man I love Dominos & Chinese. Dominos for one stands out in Quality, Value, and Service. 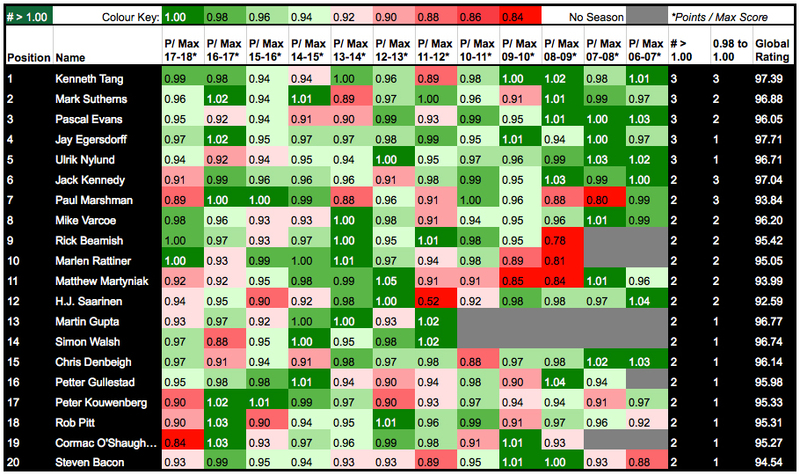 For me, the consistency table is my preferred, as this suggests a style of play that delivers season in, season out. Which is what I'm aiming for, personally. I also think Kenneth deserves more praise and recognition than he gets! Thanks so much for your kind praise and recognition. And yes you are right, I am less recognized, hahaha, though I never pay attention to this fact. Do you have any idea why this happened? Or if anyone here can think of those reasons? I'm happy to know some, thanks! But I honestly don't know, I guess some FPL managers go "under the radar" a little, just as some players do. This article will hopefully bring you and other elite managers more into the consciousness though! My crucial words of FPL are "Value for Money" and "Planning". "Value for Money" is critical, when everybody has the same budget. I put heavy emphasis on points/price. As a result, I always adopt two cheap rotatable goalie strategy. Undervalued players are most essential in this game. Best examples were Michu, Joshua King and Mahrez in their outburst year. If I can pay $6 for a $9 worth player, such transfer should always be prioritized. For example, I bought Shaw when I think he's worth $6, bought Ings when I think he's worth $7. My next transfer is Alonso, he should be worth $8. Their perceived value would be kept changing along the season. But it will be essential to tap into these players asap, not for building TV, but making your whole team "value for money" as soon as possible. Then, your team will be effectively highest in value. Building TV is another thing (More money for future GWs are good, but I prioritize value more, which explained my decision of holding on Richarlison and opt not to jump on Walcott). "Planning" is essential, as each extra trade cost 4 points. In early years, only one wildcard was given, which suits my planning appetite even more. I have no definite policy on how far I will see, normally next 6 GW, but it could be as short as 2 (Captaincy / DGW) or as long as 20 (rotating gk / def). If every player in the team is planned to play for a long enough period, FT could be reserved for adhoc issue, or for any new "value for money" player evolve. Haha that would be amusing! Thank you for the superb advice, this sort of help is like gold dust, its much appreciated! 🙂 Personally speaking, on value for money, I think I am improving this aspect of my game, and perhaps apply is subconsciously at times, but to see it explained so clearly and objectively by yourself really highlights to me how important this is as a concept. Its certainly something I will pay even more attention to in future. I often see written on here and in other places how FPL "is a marathon not a sprint", but I completely disagree with this view, and from what you've written, you do too. The early weeks of the season are imperative to act swiftly and decisively, not only to ensure you don't fall too far behind many others in terms of rank and points, but also to achieve the value for money you refer to. Not only this, but each gameweek that goes by is one less chance to pull yourself up the rankings. I feel that the long term planning aspect really kicks in after 6-8 gameweeks or so, when more information is available, assessments can be made on larger sample sizes, and the price performance landscape across the player positions is known. Theres often a fixture shift after about 8 gameweeks or so aswell, which are all reasons why the first wildcard isn't a bad idea at this time. Have you any thoughts on wildcard strategy and when deployment is optimum? P.s. Holebas was a fantastic differential pick. Inspired stuff! If the system only includes people signed up to the Scout leagues then it's all a bit pointless. Jay can't justify calling himself the best in the world when there are only a couple of thousand people in the HoF. Of course I understand that this is a good way to get people to sign up to the league from FFS's point of view, but it's not a good way to rank managers. I'll check the exact number when I'm home this evening but I think it's more like 30,000. Also when I've been tracking the top five HoF in the past I've checked sites like Premier Fantasy Tools to see if there are outstanding managers missing, and there were only a couple last year that might have ranked well. I take your point though, if anything it would erase a doubt if it wasn't limited. I would say though that the vast majority of top FPL managers will find themselves in the HoF. That's not to say the system isn't any good, it's just not a world ranking, it's a Fantasy Football Scout website ranking. It's basically ranking the members of a mini league. Even if there are only a handful of top players aren't in it, one of those top players could be the best. A way to attempt to find more top managers would be scraping every team's history page, however even that has its limitations as there could be people who never signed up to FFS who haven't made a team this season. Yeah. It should really only go back (checks own page) 4 years. Sorry, I notice you've mentioned before that "and let’s just say (the HoF is) configured perhaps ... to suit the outcome". Now you are saying, "HOF goes back over too many years, deliberately maybe, to favour and give certain players a falsely high rank simply because they have a long history in the game." Just to clarify, this suggestion that the HoF is tweaked to suit preferred outcomes is completely untrue. I built, maintain and update the HoF and I have can confirm that we have never tweaked the model to artificially boost or pull down anyone's HoF rating. The point I am making is that HOF favours players who have a full history of ORs for the period HOF is covering, and it goes back a long long way, so long that it opens up the question ( for me) of bias. That is how I honestly see it. Chop HOF off at, say, 3 or 5 years and it is fairer to all the new FFS players, but this series of articles reviewing the HOF Top 5 would be obsolete because probably 3 or 4 wouldn’t even be in the top 5 - for me that is akin to tinkering to maintain the guys at the top. I used your figures to simply add up the last 3 years OR of all of the players and most of your HOF top 10 crashed out. Obviously you are entitled to your opinion but I will try to argue my corner 🙂 in terms of recency weighting the HoF uses, some people think there shouldn't be any, others that there should be more. How to account for missing seasons is a tricky subject, and, as I say in the article, one that becomes less significant the more seasons pass. I mean Owen Walker and Eivind Almhjell are in the HoF top 20, they only have 6 seasons. Grant Barclay, current Live HoF number one, relatively few seasons as well. I think the HoF strikes a good balance between managers like Jay being rewarded for being excellent over a long period of time, and newer managers like Owen still being recognised even though they haven't been around as long. These guys are also high up in the Premier Fantasy Tools list too, (a list I'm sure Numb prefers ;)). Take as an example Dimitri Nicolaou, winning FPL at this first go, in my opinion, despite that success, I would want a longer successful season history before saying he is the best FPL manager. I also think it's very hard to hold onto number one spot in the HoF, managers do fluctuate in their rankings and new managers do emerge. I think it is harsh to say the HoF is meaningless. Certainly in terms of identifying exceptional managers to follow I find it very useful. The fact that it is the FFS HoF means there's a chance that the people who are doing well in the Top Five will comment and contribute, I think it is hugely valuable to hear their thoughts. I'm thinking of Peter (MPP), Matthew (Numb), Graeme (Gregor), who commented on a regular basis. It's great to get contributions from them. Even Kenneth Tang today, who is arguably the best FPL manager of them all depending on which method you prefer to rank managers. Yes there are one or two managers on that Premier Fantasy Tools list who would do well in the HoF. But 8 of their top 10 are in the HoF. At a glance the vast majority are in the HoF. The HoF has 36,592 managers in it. I would argue a lot of those are probably very good managers. I also prefer the HoF's method of using points divided by maximum score instead of rank. It seems a fairer way to compare managers across different seasons. I agree with most of what you say regarding HOF as a raking system, a guide to who are the better players, the weighting etc and I was harsh in this respect in saying it is meaningless. If HOF was limitec to provide the FFS No. 1 and say that most of the best players are on it, then great, but it takes a quantum leap to suggest the list is a World ranking and ‘justifyably’ provides for the World No. 1. FFS Hall of Fame great, but not a ‘World’ ranking system. Also you mention that ... ‘’ I mean Owen Walker and Eivind Almhjell are in the HoF top 20, they only have 6 seasons’’ ... then my question is why not cut off the accounting period to something more relevant like 6 seasons and as time passes maintain it at six seasons so that it is a fairer and contemporary playing field for everyone ? The reason I doubt the number of seasons accounting period will ever change is because it will remove the bias from those with a longer FPL history. Ah now that's a more valid criticism, I put in Jay's claim of being the world's number one because of its controversy. I wanted to start with two well known headlines that exist in large part due to the HoF - Ville and Jay stood out for me. And it is a claim that Jay got a bit of stick for, and one I notice he has now changed (FPL Guru and number one on FFS HoF). So perhaps it's unfair of me to include it but it was out there for a while. The HoF is the ranking system that gave him the justification to call himself number one. I would also say, yes, "a sample group of less than 1% of the game" but it includes the vast majority of the top managers. As I say 8 out of 10 in the PFT list are in the HoF. You could argue all managers should be, and that's fair enough, but that 1% group is elite. The FFS mini league always seems to finish as the top league in FPL. It wins the constructors championship if you like. The level in FFS is much higher than the average. I think 3 years is too short a history, 6 years maybe... but I think some recognition of managers who have played longer should be included. But this leads onto your comment of "bias from those with a longer FPL history", which I find irksome. Some managers with missing seasons do better because of how the HoF accounts for missing seasons. There are different types of managers, like H J Saarinen, who have erratic season ranks. Marlen Rattiner has two missing seasons, calculated at 0.89 and 0.87. His first season in FPL he got a score of 0.81. So he's been marked up for those missing seasons compared to his first because of how he went to perform in FPL. The real point is the significance of missing seasons is being overstated. It doesn't make that much difference. I should have made that point more clear in the article. I use Owen and Jay as examples and say that "Comparing Owen’s missing seasons with Jay’s early years we can perhaps understand why Owen is not ranked above Jay in the HoF." Actually a bigger reason would be the recency weighting. As I also state: "One reason Jay slips to third in this table is that compared to his HoF rating of 98.02, his Global rating of 97.71 is not boosted by his exceptional score of 1.02 (rank 105) in 2016/17. The recency weighting applied in the HoF has no impact on his Global rating." I also state (sorry to quote myself! ): "the impact of Owen’s missing seasons is lessened due to the recency weighting used in the HoF. Each season is weighted at roughly 80% of the previous one. So going back 6 seasons, the effect of those missing years has been greatly reduced." So the most recent 6 years add up to 3.69 and the first 6 years 0.97. Of those first six missing years when the HoF is calculating a score for Owen, he's not being hugely marked down, he hasn't got a score like the 0.52 H J Saarinen got when he had a bad season. 0.92 and 0.92 are the first two scores he's given. These are not unreasonable, Owen's lowest score from his active seasons is 0.93. And often managers improve the more they play FPL. Look at Matthew Jones/Numb's first season, it was his worst and he got a score of 0.92. Numb is top of the All Time Manager list on PFT. I really don't see a bias. Yes missing seasons have an affect but it is being overstated. It's not that big. I think the way the HoF works is that it tries to be as fair as possible to all managers playing the game. Whether they've played the game a long time or not, or had a break and come back or just played consistently. I accept I probably wasn't clear enough in my explanation of missing seasons in the article, I apologise for that. And I apologise to Chris, as I am after all trying to explain his system. This is the main issue I have with HOF including ranks from 8 + years ago, weighted or not, it was simply much much easier to achieve a high rank then than it is now, and for this reason I get the impression that these seasons are included to favour the regulars on here that were around in those days. I really can’t see any other reason as it is even recognised in the article that the game is not the same, new ‘chips as you mention etc. etc. I consider a typical Hall of Fame as something to recognise historical achievement, but it seems the FFS HOF has now become purely a ranking system that increasingly gives the impression in articles of being ‘the’ ranking system of FPL, whereas it only covers a tiny minority of the game. You say all best players are in the FFS mini league, but I would be intrigued to know how many of these FFS mini leaguers finished in last year’s FPL top 100 or 500 etc., do you have this number? "the main issue I have with HOF including ranks from 8 + years ago, weighted or not, it was simply much much easier to achieve a high rank then than it is now, and for this reason I get the impression that these seasons are included to favour the regulars on here that were around in those days." That's why the HoF uses points not ranks. Favour who? I don't care who it favours! I can't run the HoF because all I have is a csv spreadsheet, I can manipulate the data in a spreadsheet but I don't have the code for running the HoF. Obviously managers with two good seasons feature highly, I removed all managers with only 1 season history because otherwise there wouldn't be anyone else apart from managers with 1 or 2 seasons. Before you say anything that's only because it's much easier to have 1 or 2 good seasons in a row than it is to have 6 in a row. Are the right people in the table now? Looks good, I would probably include Pranil Sheth (aka LateRiser) as well. 5 seasons all very impressive. I like the HOF weighted points based ranking system going back indefinitely. I prefer the ranking system to fantasy tools one as that only goes back 5 years. There is an argument that hall of Fame is slightly misleading title because it’s more recent form based, fair enough, I just view it is as a form ranking system like the cricket player rankings which everyone is fine with. But the big criticism of HOF (which does not apply to fantasy tools) is that it does not include all managers, fix that even if it’s just once a year with the career rankings then you lose all that noise about it not covering all the top managers. It's all false, lies and manipulation. Developed to make certain people look better than they are. How about a system let's users pick their 5 best seasons? Or lose their worst 2 or 3 ? People who had to quit for reasons not entirely their fault , were locked out their account ( me) and could get a password reset or other reasons are punished forever for the 1 bad season. It also only takes into account people who play for OR. Agree with Epic too, not everyone joins the FFS league so it's not a true reflection . It's a load of dross mate. Especially when people are making money out of it but I don't think there is a perfect solution so it is what it is . .
What I think you're saying is you like the table when I rank managers according to the number of exceptional seasons they've had, or the 'excellent and consistent' table. Both of these tables rank according to best seasons. Kind of yes. But take out the worse seasons completely . Give every manager 5 seasons if they have that many. For those that don't they do some math and work out an average I guess. There are flaws to that admittedly but at least give people who had very bad seasons for whatever reason a chance to compete. Fair enough 🙂 and it's Chris (RMT's Professor) who is the clever one! 1) The "maximum points"-measure will depend on the number of players, hence it's not ideal for comparing between seasons. Also, the variance is pretty high at the very top. I.e. just using the 99th percentile, or 99.9th percentile (how many points you need to get into the top 1% or 0.1%) will solve these issues. Easiest solution is to just take the average, with a restriction of at least 5 seasons playing. You could also potentially exclude outliers, take the best 5 seasons, middle 5 seasons, exclude the best and worst season etc. Something like that. That way you also avoid the problem of missing seasons, which definitely should not matter. At least set that weight to 0 after a certain point. Definitely agree with point 1 and it would be interesting to see if this has any effect on the overall picture. Hey, sorry I'm being very slow this evening, been a long week - why would The "maximum points"-measure depend on the number of players? "I understand the reason is because of missing seasons"
No, it has nothing to with missing seasons, the 80% weighting is simply so the HoF shows the best active managers playing the game. Sure, there are different opinions about if % should be higher or lower, but that's the reason why. A bit late to the party on this one. I love the HoF. Looking forward to the day in 6 years time when I might qualify for a decent ranking! Love this TopMarx. Great article! Beautifully written and edited. Superb article! Solid research. Thanks great read!! Cheers Mr Williams 🙂 what's happened to your season this year? You were flying last year! Quality as always - I consider the HOF the Holy Grail of FPL. Thanks fella. Keep up the great work on your HOF pieces and I will try and get myself on that caption one day! A class bit of prose. Very, very impressive. Thanks Topmarx. It is my honor to be mentioned. A sharing of my consistency. I had one particular bad season 11/12, that I ranked outside of 100k, with 24k being my 2nd worst season. The only difference was, I hasn't watched one single game that year. In most other seasons, I watched a lot of matches, across all teams. Therefore, eye-test seems more important for me than the others. Eye-test helps me knowing the sharpness of each player, as well as the tactics of each team, that I could obtain my own difficulty matrix for teams playing against. Another interesting aspect, may probably be my flexibility in transfer. I can doing transfer to protect price change. I also fancy -8 hits for a single GW. But I'm also a super fans of patience, doing transfer with for plan of 10-ish GWs in mind. It all depends on the circumstances, and the plan associated. For example, I am having 2 FTs at the moment, not yet do my trade, when WC and chasing prices are two hottest topics recently. Somehow, I've made my choice, that being patience should be the plan for this GW. So, let's embrace different strategies, and enjoy the good fun from this game. And this game won't be that fun without your brilliant article! now this is info worth having. much the same way as i try to play but obviously far more successful. The easiest way to apply eye test, is actually on Goalkeeper. For example, Hamer. I am a big lover of two cheap rotatable goalie, but I don't like him though he is the only $4 playing GK. I saw several of his matches in previous seasons with Leicester. He played horribly. This triggers me to judge that he may lose his position to Lossl soon, or if he continues his performance will hamper the CS chance of his team. Let say I WC after GW1, I still won't get him if I need him as a rotatable GK. Such judgement is highly relied on eye test. Unluckily, he was injured, that I won't be able to prove my observation now. But we'll know if he features again. Another example is Fulham's Fabri. He made 7 and 8 saves in first 2 GWs, sounds like a save magnates, but the goal he unnecessary conceded was ugly, and several of his positionings without the ball were astonishing terrible. When Fulham has 3 capable GKs to choose among, eye test will make you more able to alert his risk of losing starting berth, than other people in fantasy. There are 8,600 people trading him in, and I would say quite many among are serious fantasy players, coz it's quite attractive if looking at the stat alone when people dreaming he will be the next Sunderland's Pickford. The above stuff can't be reflected by pure stat, such as a bad GK making 6 saves a match maybe due to the opponent shooting terribly. Sharing an attacking example. Eye test usage is important to the chemistry among players. You can read positioning by heatmap, counting ball movement by who pass to who from stat, but it's harder to relate how a teammate running without the ball when he is creating space for another teammate. Say, if Firmino not play, but featuring Sturridge, I may down-value Salah more than the crowd, a lot less likely to captain him, may even trade him for Hazard if Firmino out for a month. My experience is, if previous eye-tests could offer me intangible but key information, that I may not locate from the public data set, I could create my own data to quantify the impact, such as Salah's performance without Firmino but with Sturridge. That said, pure stat is still more powerful than pure eye test. Again interesting. My eye test player this season has been Ings. Liked his workrate (something Vardyesque about it from 2 years ago) but he also had a mini "Cruyff turn" and created an opportunity out of nothing for himself and I thought right you're in. Agree with your observation. I valued him $7. By eye test, I saw his improvement starting from he played the final several games for Liverpool last season. He is more all-rounded than his Burnley time. And by eye test, the current Southampton is more a lot more attacking than the Burnley time when he played. By stat, somebody would expect him scoring a lot more than his Burnley time (11 goals 4 assists), but be also careful that he should play fewer minutes (3025 at Burnley) as there are Austin, Gabbiadini and Long on the bench. You can easily get his expected points by the excellent RMT tool, but how much more you want to adjust him up, depends whether you think the stat backing up the RMT maybe quite different from your eye test, and that could be where the value lies on, and probably why I consistently perform quite well in this game. You may further read one of my replies up above, if you find this topic interesting. It's fascinating to hear about your approach. You obviously have a good eye for watching players and teams, and interesting that you don't follow one style of management - preferring to adapt. Following different Top Five managers over the past couple of years, I was surprised how different approaches can be successful. There certainly isn't one way to play the game. I know you mention your Fantasy Football prowess in business presentations 🙂 but I was wondering what your background is? Do you have a connection to football? Or just a natural talent for spotting which players are coming into form? One more question - do you listen to the opinion of others when making decisions or do you just rely upon the method you've developed? Yup, just share some examples of eye tests above. The key point is, when a new player starts to play or a new team system starts to perform, before the stat forms any solidity, eye-test helps me to judge things in advanced. Examples like low goal conversion by Taraabt, or low assist conversion by Cedric. By eye-test, you don't need to wait that long and knows why these cases happen. Eye test on teams are equally essential. Team tactics and player selections are critical, more than people believe, for the performance of each player. I am a manager and coach of an amateur soccer team, so I may be more sensitive than others to observe something special. About my background, if relate to my success in Fantasy, should be talking about data analytics and prediction model. I got banned from Casino in several countries, being an advantage player. I won the national poker competition recently. I am running a company doing algorithm trading on investment, earning triple digit percent gain in previous 12 months. That said, I never adopt similar level of sophistication in Fantasy. The players' pool is not that huge. It makes analysis a lot easier to do than the investment market. I do listen to others, if those are good quality comments. It saves me time to locate what the major considerations are, or where I should analyse further. When making decision, it's always on my own model. For transfer, I seldom consider ownership. For captaincy, I seldom the votes in this community. But I will read the writings and arguments. Ownership and votes are noise. Arguments are useful, especially if quantifiable. Thank you for sharing so much of how you play the game, the examples you gave are very useful for illustrating your points. Interesting to hear about your background - soccer coach, poker player, investment trading - the perfect storm for FPL success! I hope to hear more of your thoughts as the season progresses. How you use the eye-test to give meaning to stats is particularly interesting. And you make it sound so simple - make your whole team "value for money" as soon as possible. That's very clear easy and advise to follow. Hi Topmarx, thanks for your kind words. I feel a bit embarrassed to have your praise, coz I actually think that I should put up a better interview, with better contents, share my thoughts in deeper details, etc. Hope I can do a better one in future when chance comes by. But one thing is true, it's so wonderful to have my little boy around me now. Thx! I'm shocked and saddened to hear the news, wishing you the best for a full and speedy recovery. If there's anything I can do to help, just ask. Thinking of you and your family. Incredible amount of work put into this and a great read, thank you! Always nice to read these articles .. great job TopMarx !! I’m gonna have to win FPL 2 years in a row to get on these lists. 61st in the world and he still didn't win his office league....where does he work? MI5 Statistics and Analysis Dept? Love this article. Thanks for all the hard work & data crunching!